A few days ago I had to do some research on iron mining and the production of ferric oxide in relation to ancient Japanese place names of Mino province. 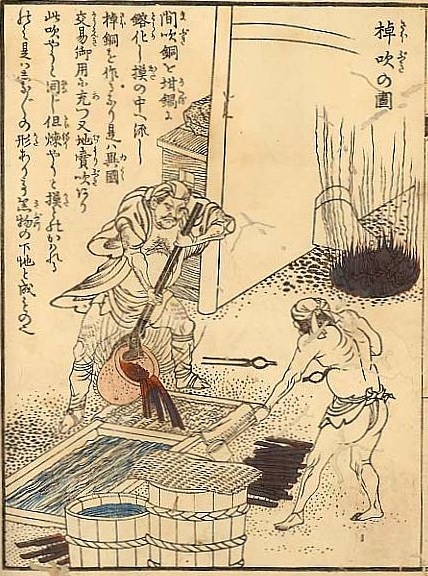 In the course of this research I stumbled upon Edo-period copper production and as I am of course also interested in the old kinkô craft, I was curious about how the old kinkô artists got their raw materials. Well, as I am quite busy at the time I focused just on copper and more details on other metals might follow in the future. One of the largest copper mines was in Besshi (別子) in Iyo province on Shikoku. The mine was discovered in the third year of Genroku (元禄, 1690) and opened one year later by the Sumitomo family (住友), yes the Sumitomo family which was one of the most significant zaibatsu in the early decades of the 20th century. From the mine the raw copper (sodô, 粗銅) was shipped along the Seto Inland Sea to the Ôsaka Bay and via the Nagahorigawa (長堀川), a river which became a road in 1964, up to the Unagidani district (鰻谷) of Ôsaka. There the raw copper was processed to refined copper (seidô, 精銅) and casted according to the intended use. The Besshi copper mine was very lucrative for the bakufu as it exported thousands of tons to China and Holland via Nagasaki. Accordingly, a distinction was made in Ôsaka between the bakufu export copper (goyô-dô, 御用銅) and the copper distributed and sold on the domestic market. In concrete terms, the casters of Unagidani (see picture 1) casted basically three forms of refined copper: The saodô (棹銅, lit. 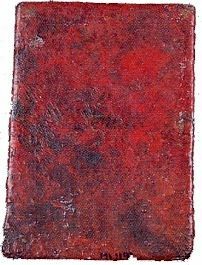 „pole copper), teidô (丁銅, lit. „block copper“) and marudô (丸銅, lit. „round copper“). The saodô poles (see picture 2) were the form for the export and it was strictly forbidden to sell them at the domestic market. They measured about 23 cm, had a diameter of about 1,5 cm and weighed about 250 ~ 300 g. For the export, 200 of them were put into special boxes of 100 kin (斤, ~ 60 kg) (see picture 3). 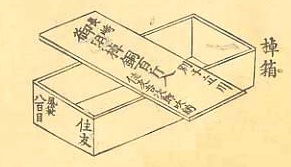 These boxes were shipped from Unagidani to Nagasaki. The teidô plates (see picture 4) were used for the production of tiles or tools like pick hammers. The marudô (see picture 5) in turn was the form which was used by the kinkô artists, kettle makers and the like. Well, that´s enough on that subject for the moment and more articles will follow next week when I have more time.